Why can’t I just report the R-square? That’s easy enough isn’t it? When people who are unfamiliar with effect sizes learn that various effect size indexes such as R2 are generated automatically by SPSS or STATA, the temptation is to report their R2 and just leave it at that. But the coefficient of multiple determination, or R2, may not be a particularly useful index as it combines the effects of several predictors. If you are interested in the effect of a specific predictor, rather than the omnibus effect arising from all the variables in your model, you might want to consider other options such as the relevant beta coefficient (standardized or unstandardized, depending on what you plan to do with it). Another option is to report the relevant semipartial or part correlation coefficient which represents the change in Y when X1 is changed by one unit while controlling for all the other predictors (X2, … Xk). Although both the part and partial correlations can be calculated using SPSS and other statistical programs, the former is typically used when “apportioning variance” among a set of independent variables (Hair et al. 1998: 190). For a good introduction on how to interpret coefficients in non-linear regression models, see Shaver (2007). Across many disciplines there are growing calls for relevance and engagement with stakeholders beyond the research community. Academy presidents and journal editors alike are calling for researchers to evaluate the substantive, as opposed to the statistical, significance of their results. Yet the vast majority of researchers are under-selling their results and settling for contributions that are less than what they really have to offer. Using FAQs and a class-tested approach characterized by easy-to-follow examples, Effect Size Matters will provide you with the tools you need to meaningfully interpret the results of your research. Effect Size Matters is a 54 page e-book. 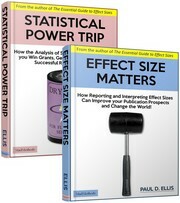 If you’re looking for something a little more substantial, I recommend The Essential Guide to Effect Sizes. Say you’ve got an effect size equivalent to r = .25. What does it mean? How do you interpret this effect size? Ideally you will be able to contextualize this effect against some meaningful frame of reference. But if that’s not possible another approach is to refer to conventions such as those developed by Jacob Cohen. According to Cohen, an effect size equivalent to r = .25 would qualify as small in size because it’s bigger than the minimum threshold of .10, but smaller than the cut-off of .30 required for a medium sized effect. So what can we say about r = .25? It’s small, and that’s about it. But Cohen’s conventions are somewhat arbitrary and it is not difficult to conceive of situations where a small effect observed in one setting might be considered more important than a large effect observed in another. As always, context matters when interpreting results. You are currently browsing the archives for the effect size category.